After leaving office, President George W. Bush moved back to Dallas and taken up golf and mountain biking, but still the former president wanted something more. He found that by picking up a paintbrush. "I'm a good example of pushing boundaries and seeking new avenues for learning and I never thought I'd be an artist," Bush said. It was an essay, Winston Churchill's "Painting as a Pastime," that sparked his newfound interest in art. "The president was one of the greatest learning experiences of all time -- the presidency -- I learned a lot and after the presidency I thought, 'What am I going to do?" Bush said. "The painting came along and it's opened up whole new vistas for me -- a whole new way of thinking, a whole new study pattern." Teaching him the new study pattern were three North Texas art instructors. He started as a beginner under the direction of Gail Norfleet, a fine artist who shared a mutual friend with the former president. "She said, 'Well this student wants private lessons.' And I said, 'Well who is it?' and she said, 'Um, George Bush.' And I said, 'Well, I'm speechless,'" Norfleet recalled. She said the two did not see eye-to-eye on political issues, but that did not matter in art. "I even wondered what my friends might say -- I was working with George Bush," Norfleet said. "As we got to be friends and as he was so accepting of my ideas, I became more comfortable and I found him to be a very reasonable person." The president said Norfleet did a noble thing as an instructor by knowing when to let go and transition him to another instructor. She sent him along to Jim Woodson, an artist who painted one of the works that hangs in the Bush home. Woodson found his student to be determined. "All I had to do was make a suggestion and he would try it -- of all the students I taught in my life, he was probably the most open to trying things in any of them," Woodson said. Each instructor met with the forty-third president at his home in Dallas, in what the instructors all called the "man cave." The president is quick to correct that name, which has changed. It is now an art studio. There, the president painted just about anything around him. "I've painted the cats. I've painted the trees. I paint just about anything that comes to my mind, and I cannot tell you what a liberating experience it's been," Bush said. Sedrick Huckaby, Bush's third instructor, said there was a moment that took the president's art to the next level. "I told him, one day at the table, and said, 'You know? You painted the world leaders and that was an interesting group. But what about the people who have been of service to you?" Huckaby said. "I didn't know what I meant by that -- he could have painted the people around the house, but the moment I said it, he said, 'The vets! The vets!' and he picked up the phone right there and started calling people." What followed was Bush's mission to honor those who served him as the nation's commander in chief. "I put a lot of emotion into it," Bush said. "As I was painting them I was thinking not only about my relationship with them, either on the golf course or mountain bikes, but I was thinking about their stories of recovery. "These are people that don't want to be called heroes," Bush said. "They just want [others] to say thank you for doing a good job and I don't want people to feel sorry for them." The result of the president's quest to paint, and paint what was close to him, was profound, according to his instructors. "It was very comforting for him to do that," Huckaby said. "So now he was dealing with a subject that was so close to things that he dealt with -- that was a comfort." He would paint for hours and hours a day. In all, 66 portraits of men and women who served after September 11, under then-Commander in Chief George W. Bush. "It really was quite amazing and I thought, 'How is he living with this?' All of these people and all of these guys with a story, good and bad," Norfleet said. "When I saw the exhibit at the Bush Center and I walked around it, really -- tears kind of came to my eyes. I found it to be a wonderful accomplishment." 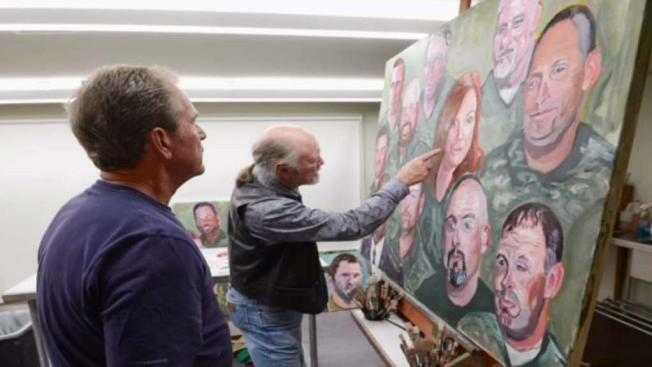 The former president's passion for painting turned into a way to honor those who served him. "Think about it. They got a Ph.D. in life and they've learned leadership skills that are going to help us in the long run," he said. "I hope people come away thinking, 'Wow, this guy cares about them.'" The "Portraits of Courage" display has been extended at the Bush Presidential Center in Dallas and will now run through mid-October.